Through the 1990’s and early 21st century Snap Trax were without doubt the finest Postman Pat toys available, at least up until Character took over as master toy licensee in 2007. 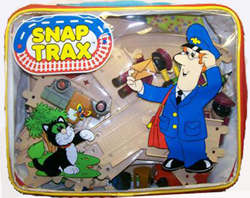 Snap Trax was a trading name used by Born to Play to market, amongst other properties such as Bob the Builder, interconnecting playsets with tracks for toy vehicles. These sets were sold at the Early Learning Centre (ELC) amongst other retail outlets. Born to Play released several different Snap Trax Postman Pat sets which together assembled a toy version of the village of Greendale. The vehicles supplied were pull back and go versions with push button sound effects. The scale was smaller than the larger friction powered ER (Born to Play) Postman Pat vehicles, though much larger than the first ERTL or Corgi die-cast vehicles. 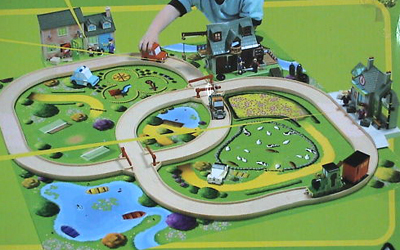 The Snap Trax Station Set, for example, included an oval track made up of 12 pieces, Greendale Station, the Greendale Rocket and an Ajay figure. The Snap Trax Greendale Rocket had pushbutton sound effects (train noises and Ajay phrases) and pull back and go capability. Greendale Station had a working outside light with interior switch as well as an opening door and station clock with moveable hands. The 2″ scale Ajay figure has two suitcases to carry and load. This set was contemporised by Character Options for their 2010 release of the Greendale Rocket Train Set. 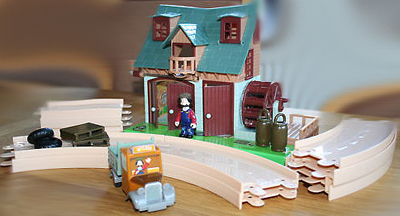 Other Postman Pat Snap Trax sets included Ted Glen’s Watermill, the Post Office Set and the Greendale Superset. The Snap Trax sets have many features. Ted’s Watermill has a working interior light, winch, water wheel and opening doors. The Watermill set comes supplied with little balls for turning in the waterwheel which has a little turnable handle. The swinging arm crane can be used to winch up the tyres and barrels supplied. The Ted Glen Truck that comes with the Watermill has sound effects; when activated it emits several typical Ted Glen phrases. The Post Office Playset has a working light, opening doors, plus a letter box with opening lid and sticker stamp machine. 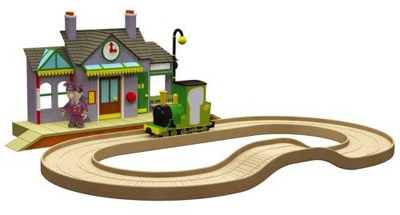 The set comes with 12 pieces of connectable track featuring road on one side and rail on the other. The Post Office set also includes Pat’s Van, Pat 1, with sound effects; press the button on top to hear Pat say “I’d better get on with my deliveries!” Other sound effects include Pat 1’s engine revving and its horn tooting. Two figures are included – Postman Pat and Mrs Goggins. The Greendale Superset had a giant plastic playmat that the different parts of Greendale village could be located on. Some elements of the set even had light effects. 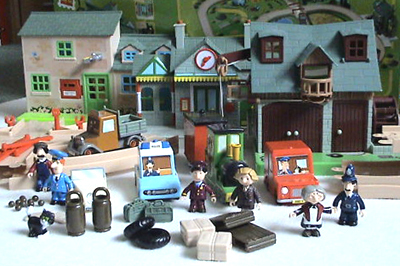 The full set included five Postman Pat vehicles (Postman Pat’s Van, Ted’s Truck, PC Selby’s Car, Dr Gilbertson’s Car and the Greendale Rocket Train) and seven Postman Pat figures (Mrs Goggins, PC Selby, Ted, Pat, Ajay, Dr Gilbertson and Jess).